YOU CAN MAKE RAMAH AVAILABLE TO EVERYONE! have forever changed our lives and the lives of our children. 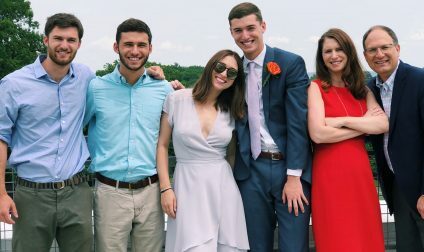 Ramah’s transformative impact is enhanced by Ramah L’Kulam: Making Ramah Available to Everyone, including campers who need scholarship aid or depend on the firm foundation of the Tikvah Program, in both Palmer and Greater Washington. It takes EVERYONE to make a community that forges friendships for life. It takes EVERYONE to make Ramah a welcoming place for campers with disabilities. It takes EVERYONE to make Ramah a home for campers from diverse economic backgrounds. It takes EVERYONE to make Shabbat singing and Havdalah magical. But it takes over $500,000 a year for Ramah to be for EVERYONE. That is the cost of financial aid to support our campers in need, and to sustain our exemplary Tikvah Program. We ask YOU to join us in making a gift to Camp Ramah to ensure that Ramah continues to be available for EVERYONE. Todah! P.S. Donors of $1,800 or more will become Ahava Society members. Click here to view our 2018 Ahava Society. If you would prefer to give by mail, please send your check to: 1206 Boston Providence Highway, Suite 201, Norwood, MA 02062. If you would like to make a recurring monthly gift or for other information, call Mindy Goldstein at 781.702.5290 x109.